In my last writeup, I recovered mysql credentials from a server and wrote a webshell to disk from there. This time, we’ll look at further leveraging the database contents by dumping hashes, cracking them with John The Ripper and also bruteforcing a WordPress login with Hydra. For real engagements and situations where there are security concerns with putting a password in plaintext, you can omit the -password flag and instead be prompted to enter the password upon connection. We can see there are several. The interest for today is wordpress however loot and proof were interesting and I encourage everyone to check them out themselves. We could just copy and paste this list since it’s only 16 entris. However we can also write this into a file and retrieve it from the server. 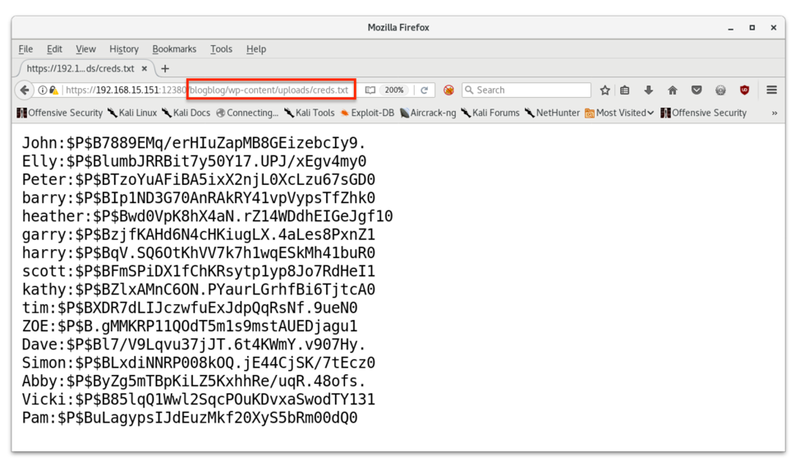 In my previous post, we wrote a webshell through mysql and placed it in the /var/www/https/blogblog/wp-content/uploads/ directory. Now that we’ve got the password hashes off the server, let’s get cracking! Since I’m running Kali in a VM, I am not able to run hashcat becuase I don’t have a GPU to run it on. My go-to for cracking hashes is John The Ripper and the rockyou wordlist. Not because these will always get me results, but because for CTF-style machines like many on VulnHub, if the hash is supposed to be cracked, these should do it. These are phpass hashes which I had not had experience with before. I tried giving John The Ripper the user:pass format to crack the passwords and correlate them back to the username associated with it. However the file caused a formatting error which I did not expect. I was able to run John The Ripper successfully with just the hashes, no usernames. The rockyou.txt wordlist cracked about half of the hashes. But now I had a different problem: Which password belongs to which account? To correlate the usernames back to cracked passwords, I chose to use hydra. I copied the usernames into one file and the plaintext passwords another. Brute-forcing web logins is a little more involved than other services like ssh. This is because you have to provide the field names for each parameter as well as session cookies, and what an unsuccessful attempt looks like. 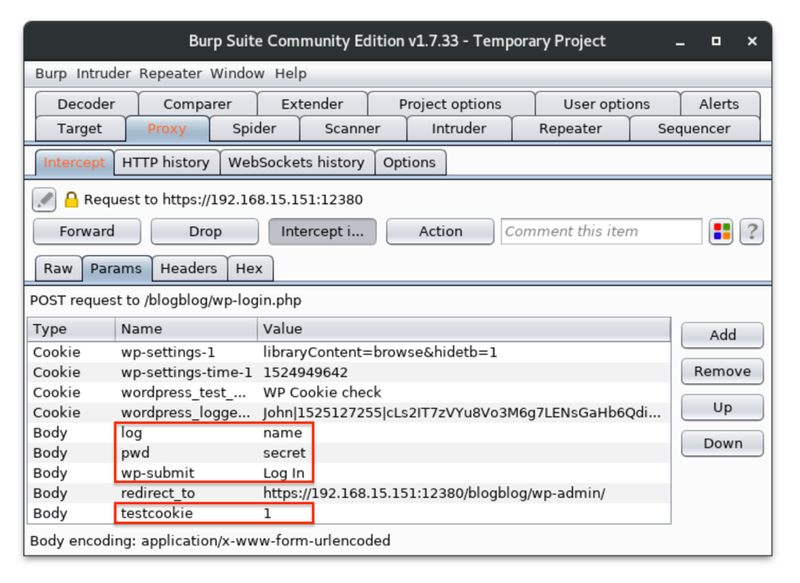 To get the neccessary field names, I fired up burpsuite and created a test login to intercept the fields that are sent during an authentication attempt. I entered name as the username and secret as the password. When I intercepted the request with burpsuite, I was able to see that there were other fields that were also neccessary for a login attempt. 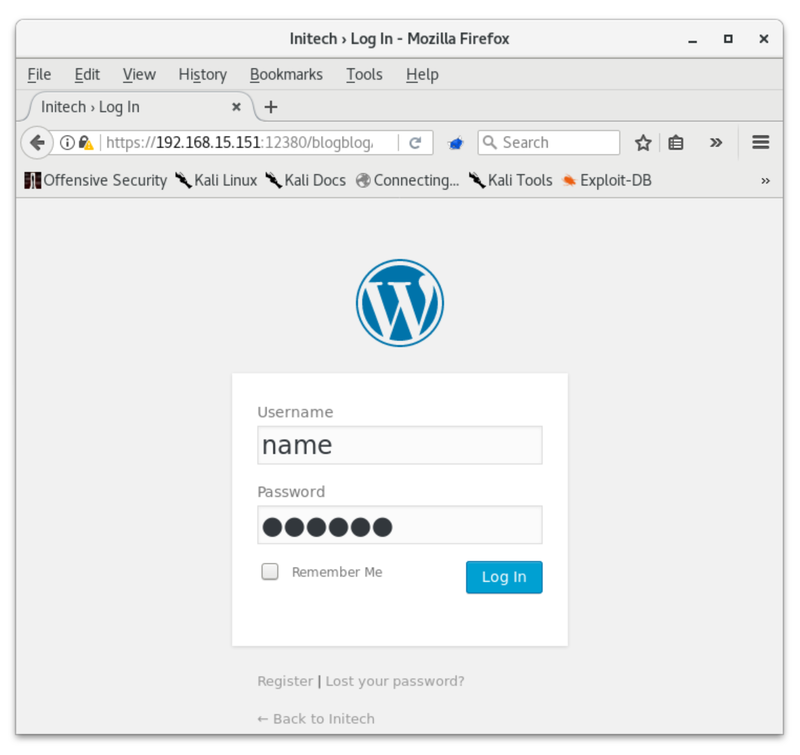 In total, I’ll need to specify four fields, log as the username, pwd as the password, wp-submit as the Log In, and testcookie being equal to 1. When WordPress redirects a successful authentication, the page contains Location in the source; this is not the case for failures. We can give all of this infomation to hydra in order to bruteforce these passwords. hydra uses ^USER^ and ^PASS^ as anchor fields to iterate through during a brute-force attempts. Since this command is rather long, I put it in a shell script for easy editing and saving for later and named it brute.sh. Here we see that hydra was able to match all the passwords to their usernames in a matter of seconds! Bruteforcing is a noisy thing to do on a machine with any type of logging or monitoring. There is the potntial for tripping up an Intrusion Prevention System which could blacklist our IP. However since this machine did not have any sort of protective measures, we could have run hydra with our list of users and rockyou.txt as the password list and gotten the same results without John The Ripper. We were able to crack multiple credentials for WordPress Administrators. These accounts have elevated privileges that allow them to potentially write arbitrary files to disk on the machine. This is a likely path to getting a shell on the box.